Born in Hondarribia (Guipúzcoa - Spain) in 1973. After finish her studies at the Superior Conservatory of San Sebastian and Madrid she goes to Copenhague (Denmark) where she received master classes with Mogens Ellegaard during the course 91-92 at the Royal Academy of Copenhague. Along this last years she has participated in several recordings (CDs) of original music for accordion. In 1996 (March) she was elected accordion soloist in the JONDE (National Young Orchestra of Spain) performing with this Orchestra in San Sebastian, Zaragoza, Sevilla, Jaen, and making a registration in CD of Oratory “La Peste” by spanish composer Roberto Gerhard. This concert had a big success in the festival PROMS in London. Also she has participated in Chamber Music Meetings of this orchestra playing Kammermusik nº 1 by Paul Hindemith. "She has been Music Review during two years of the journal Adelantado de Segovia and Accordion Teacher in the Conservatory of Music in Segovia. 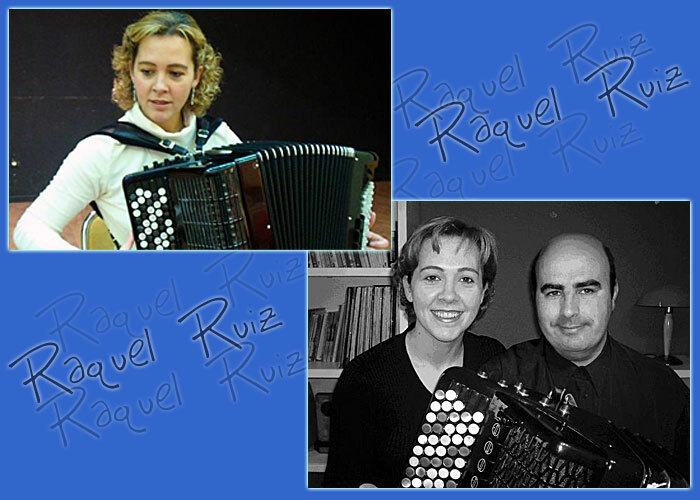 Recently she got the first place in the exams for Accordion Teachers 2006 in Madrid and now she is teaching as Accordion Profesor in the Conservatory of Music "Arturo Soria" in Madrid. © Copyright 2005 Accordions Worldwide. All rights reserved.